Boehner is acting as imperially as is Obama. Now that the election is over, why is Boehner rushing to fund Obamacare and Amnesty before the democrats who lost their seats, leave? Is Boehner so scared of the MSM that he would betray his party and constituents? Or, more likely in my opinion, is he a democrat wearing a republican label? Regardless, he is pushing an $1Trillion omnibus bill over the objections of the conservatives in the House. Boehner is aware that McConnell will rubberstamp it in the Senate. Both are despicable members of the ruling class in DC. Initially, Boehner was copying Pelosi’s tactic, “you have to vote for it to find out what’s in it.” Fortunately for us, some have seen it and are telling us what really is in the funding bill. The explanatory statement regarding this Act, printed in the House of Representatives section of the Congressional Record on or about December 11, 2014 by the Chairman of the Committee on Appropriations of the House, shall have the same effect with respect to the allocation of funds and implementation of divisions A through K of this Act as if it were a joint explanatory statement of a committee of conference. What it says in plain English is that the appropriations committee chairman will have authority to write in changes to any of the appropriations bills after the bill is passed. Usually this is done by a conference committee before the vote and indicates how and where they would like to see monies spent. This provision could allow the chairman to sneak in something or make other changes after the vote! None of the funds appropriated in this Act shall be expended or obligated by the Commissioner of Social Security, for purposes of administering Social Security benefit payments under title II of the Social Security Act, to process any claim for credit for a quarter of coverage based on work performed under a social security account number that is not the claimant’s number and the performance of such work under such number has formed the basis for a conviction of the claimant of a violation of section 208(a)(6) or (7) of the Social Security Act. (PP. 958-959). Department of State: $932 million. Includes a provision to assist Central American countries in improving their border security. (PP. 1303 — 1306). No funds appear to be allocated specifically to this activity but the Democrats’ bill summary identifies $260 million “to respond to a surge of unaccompanied children from Central America coming to the U.S. The funds will be used to implement a prevention and response strategy focused on border security and the reintegration of migrants, as well as the causes of the migration, including programs to improve education and employment, support families, counter gangs, coyotes and drug cartels and professionalize police forces.” See p. 53. Note that the above does not refer to U.S. border security but that of Central American countries — an absurd gesture. The three Northern Triangle states of Honduras, Guatemala and El Salvador facilitated this year’s migration. Their borders are much tighter than ours. If they wanted to shut them down, they could. Flush $260 million. The GOP House leadership wants amnesty. Rep. Pete Sessions has said publicly that Republicans did not intend to repatriate the illegals who overwhelmed the border in 2014. Regarding any immigration “reform,” Sessions emphasized that the plan, “even in our wildest dream, would not be to remove any person that might be here, unless they were dangerous to this country and had committed a crime.” They structured the CROmnibus specifically to give Obama what he wants, allowing him to take the heat for it while they pretend to oppose it. Their real goal is to pass comprehensive immigration “reform” in 2015 that will look much like George W. Bush’s failed effort in 2007. The Leadership’s amnesty goals defy all logic. Those illegals brought with them a dictionary of new diseases, including most likely, the Enterovirus outbreak responsible for at least 8 deaths and numerous cases of serious paralysis. Illegals commit heinous crimes in disproportionate numbers. A major reason the GOP swept elections nationwide is that most Americans — including Democrats and Hispanic Americans — do not like Obama’s open borders policies and want illegals sent home, not to remain here stealing jobs and overburdening our welfare system — already stressed to the max. Poll after poll indicates this. $5.4 billion for Ebola efforts in Africa — more than provided to fight ISIS. Club for Growth is urging all members of Congress to vote “NO” on the Cromnibus (HR 83), as is Heritage Action for America, the political action arm of the Heritage Foundation. Conservatives may have an unlikely ally in Senator Elizabeth Warren. Warren has become the Democrat’s latest folk hero following the ignoble flameout of Wendy “Abortion Barbie” Davis. Warren has called on Democrats to deny support until one objectionable provision regarding the Dodd-Frank law is removed. The Teamsters have weighed in as well, asking members not to support Cromnibus because of changes to multi-employer pension legislation. Both sides may be willing to consider a short term 90 day CR should the CROmnibus fail to pass, but the White House understandably prefers the monster. The Hill, at the time of this writing, has released the names of 13 ‘Pub and 17 democrat House members who have said they will vote against this abomination. Tim Huelskamp of Kansas is on the list. Our own Vicky Hartzler is not. Is Vicky so enamoured with her committee assignments that she’ll sell us out and vote for this monstrosity? Calls and emails to her office have been unanswered. If nothing else, the government ‘shutdown’ and debt struggle has allowed us to definitively weed the the useless pols in Washington from the productive Congressmen. Of the Missouri congressional delegation, four voted to support Reid and Obama—that’s what the vote really was all about. Those MO Congressmen were Lacy Clay, representative from St. Louis, Emmanuel Clever, representative from Kansas City, Claire McCaskill, democrat senator, and Roy Blunt, GOP establishment senator. Roy Blunt’s votes validate the ‘Replace Roy Blunt‘ movement that is growing in the state. The Senate passed the ‘Run up more debt’ bill by a vote of 81-18. It’s easier to document who, among the GOP senators voted against the bill—and against Reid, Obama and McConnell, than it is to document those who supported Reid and Obama. These first three are expected to be front runners for a conservative presidential candidate in 2016 according to WaPo. I have my strong doubts about Rubio. He’s burned all his bridges with the Tea Party and grassroots conservatives. Two Senators face strong opposition in the next election. Liz Cheney is said to be running against Enzi and Milton Wolfe against Pat Roberts. There is a graphic, if you follow the link above, that depicts the actual breakdown by political party. The House—John Boehner approved the Senate bill. Boehner had to enlist Nancy Pelosi and House Democrats to get that approval. In the end the Senate bill passed in the House on a vote of 285 to 144. Locally, I was gratified to see all of Missouri’s GOP Representatives voting against the Senate bill and Boehner. The only two MO representatives who voted yes were democrats Clay and Cleaver. I have had some harsh words for GOP Representative Vicky Hartzler over her votes on the massive Ag bill earlier this year. I have to applaud her for her votes on this bill. She stayed with her constituents. The votes from the Kansas congressional delegation was more mixed. To say I’m disappointed in Senator Jerry Moran and Representative Lynn Jenkins is an understatement. So where do we go from here? As usual, Erick Erickson from Red State has thoughts on that. It was always about undermining Obamacare, despite the claims of others. But, those of us who were in this fight against Obamacare have been quite open that we knew there were side benefits. This fight would expose conservative activists to the frauds they have funded. Republican leaders in Washington want you to get off the field. Instead, get involved and get even. — Red State. Our enemies have chosen us. Now it is time for us to choose their replacements. “Make it hurt!” That’s been Obama’s instructions to his troops when the Shutdown began. He had been planning for the shutdown for some time. The blockages, barriers, and propaganda appeared within minutes of the deadline. Who are Obama’s targets? Those who have invested the more in our nation—the veterans, the military, the sick, the rank-and-file conservatives, anyone who won’t line up and kiss Obama’s feet. The Washington Examiner identified six target groups, groups chosen by Obama as his personal enemies. I can only hope he reaps what he’s sown. It will not be what he thinks. Most people — even the poor in state-run safety net programs — don’t have that many interactions with the federal government agencies affected right now by the shutdown. So it’s a challenge to make people notice that your agency is vital to the survival of the Republic. The feds have to apply a lot of force and behave in unsubtle ways to make you angry with Congress. No group has been more visible during the shutdown than veterans. Memorials were closed, and House Democrats voted against bills that would restore funding to veterans programs. Just 4 percent of employees at the Department of Veterans Affairs have been furloughed, according to Government Executive magazine, making it even more odd that the department’s funding wasn’t restored. Suddenly, owning a home on federal land causes homeowners to be kicked out of their domiciles. Ralph and Joyce Spencer, an elderly couple who own a Lake Mead cabin, were forced out of their homes by park rangers saying they had to leave until the federal government reopens. The Spencers have owned their home since the 1970s, and fellow Lake Mead resident Bob Hitchcock, who’s owned a cabin on the lake for 26 years, said he wasn’t told to vacate during the previous government shutdown that occurred under the Clinton Administration. House Democrats also voted against a bill to restore funding to the National Institutes of Health, a federally funded medical research center. Yes, there is privately funded cancer research still occurring, but saying no to cancer research of any kind is probably not a winning strategy. NIH is an agency within the Health and Human Services Department, which furloughed 49 percent of its employees, according to Government Executive. House Democrats (noticing a pattern?) also voted against funding that would allow members of the National Guard and Reserves to return to work during the shutdown. Democrats say the reason they won’t pass piecemeal funding bills is due to GOP “cherry-picking” parts of the government to fund instead of funding the entire government. Imagine saving up to visit the nation’s capitol or the Grand Canyon. The family is packed up and ready to fly — or drive — cross the country to see the sites and have a great time. Then the government shuts down. No worries, how can the government shut down open-air monuments? Well, apparently they can — and did. The Grand Canyon National Park is closed. How does one shut down a giant canyon? Apparently with gates and barricades similar to those veterans crossed to see their monuments. Gov. Scott Walker, R-Wis., refused to allow the federal government to close state parks in Wisconsin, since the state had the authority to operate the parks and provided most of the funding for them. Mount Rushmore is also closed. Cones have been placed along the highway to keep tourists from pulling over and snapping pictures of the monument. Because it’s apparently cheaper to pay people to set up cones than it is to … not do that. 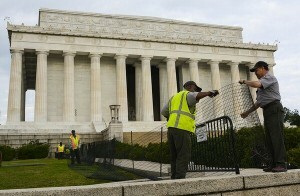 Across the country, in D.C., the Lincoln Memorial is closed. Note that this monument was not closed during the 1995-96 government shutdowns. Barricades were also set up outside the Martin Luther King Jr. Memorial. The National Parks Service attempted to shut down Mount Vernon, George Washington’s home. Problem is, the site is privately owned and operated by the Mount Vernon Ladies Association. Also, NPS tried to shut down the Claude Moore Colonial Farm, which hasn’t received federal funding since 1980. Oops! The NPS is on a roll, actually, when it comes to closing down privately owned businesses. One thing that isn’t closed during the partial shutdown: tax collection. “The IRS will accept and process all tax returns with payments, but will be unable to issue refunds during this time,” the IRS website said. Every day we hear of more villainous acts by the federal government and their surrogates. The National Park Service seems particularly apt and eager to oppress the public. Over the weekend the NPS issued 21 tickets to people wanting to see the Grand Canyon. They must appear in person before a federal Judge. I wonder how long it will be before some trigger-happy federal JBT shoots someone for wanting to see one of our nation’s treasures? We’re in day three of the shutdown and, besides closing public access to open air memorials and blocking access to privately owned parks and memorials, nothing much has happened. Oh, people are being hurt. People chosen specifically by Obama, like the military, who, on a hunt and miss selection, have had their commissaries closed—commissaries and other facilities, like golf courses—except for Obama’s favorite golf course at Andrews AFB outside Washington, DC. For those who don’t know what the commissary is, it’s a supermarket for military dependents. The prices aren’t all that much cheaper anymore. Commercial groceries, Walmart, has matched prices in most locations. No, the issue is that in some locations, the nearest civilian grocery is 60 miles away! The House ‘Pubs are standing their ground. I’m surprised, frankly. Perhaps it is due to Senators Cruz and Lee meeting with House conservatives providing leadership missing from Boehner and Cantor. Harry Reid blocked the CR. He blocked the 2nd and 3rd revisions because each either defunded Obamacare or defunded parts of it, or delayed its initiation. Now, the House is sending up specific funding items aimed a specific functions—fund the military, National Guard and Reserves, fund the National Parks, fund medical research. Each time, Reid had blocked those efforts. It’s time to lay aside the entire effort to fund the government by Continuing Resolution. Let’s either fund the government piecemeal, which Harry Reid hates, or submit a budget—one the defunds Obamacare and cuts, drastically, Obama’s bureaucracy. It’s time to do one or the other or keep the government shut down. The House has the responsibility for funding legislation. Let’s use that responsibility as originally intended by the Founders, as checks and balances against a tyrannical executive branch. House Republicans are unlikely to blink in the standoff over Obamacare that precipitated a government shutdown, fearing that acceding now to Democratic demands for a “clean” spending bill would weaken their hand in upcoming negotiations over the the debt ceiling. Those Republicans said Wednesday that the spending impasse that shut down the government early Tuesday is less about conservatives’ desire to derail Obamacare than it is about strengthening their hand in the debt-ceiling talks. That borrowing limit must be raised by Oct. 17 to prevent the government from defaulting on its financial obligations and Republicans say any future agreement to reopen the government would link the spending bill and the debt ceiling. In the weeks leading up to Tuesday’s government shutdown, House Republicans pushed for a short-term budget bill that would fund the government at current levels, but also fully and permanently defund Obamacare. President Obama and Senate Democrats rejected that proposal and three others that would have at least slowed implementation of the Affordable Care Act. House Republicans now say they won’t agree to a funding bill unless Senate Democrats agree to meet in a conference committee to hash out their differences. They rebuffed a proposal from Senate Democrats Wednesday to form a conference committee only after the funding bill was approved and the government reopened. With the third day of the shutdown dawning and the deadline to raise the debt ceiling fast approaching, House Republican leaders believe maintaining party unity over the budget bill is paramount. Any divisions or concessions would only bolster Obama’s hand in the debt ceiling talks. House Republican leaders will drive their rank and file particularly hard to support a debt ceiling proposal that includes provisions on tax and entitlement reform and other GOP priorities. They also don’t want to cut short the epic battle against Obamacare that conservatives have long sought. For those reasons, House Speaker John Boehner, R-Ohio, is unlikely to put up a “clean” budget bill that funds the government without Democratic concessions. House GOP leaders and most of their rank and file never supported conservatives’ efforts to use the budget bill and the threat of a government shutdown to defund Obamacare, fearing a political backlash. Polls consistently show most people oppose the strategy and would blame Republicans if the government closed. But having gone as far as they have, House Republicans now say they won’t back down. And they expect to score political points in the process. The article continues at the website. It continues with the statement that House ‘Pub leaders were surprised when Reid blocked their efforts to fund the government piecemeal. If that is true, Boehner and Cantor are more stupid than I ever believed. Obama really pissed Mark Levin off yesterday. I don’t know how many of you listen to his radio show, but yesterday’s broadcast was a jewel. On the air, Levin read an article that Obama had specifically ordered the National Park Service to close the WW II Memorial in Washington, DC. These orders were issued after a ‘Pub congressman asked Obama to exclude the Washington memorials from the shutdown. Honor Flights, for WW II veterans, had been scheduled for this and coming weeks and the ‘Pub congressman saw no reason why these aging veterans should be disrespected. But disrespect them is exactly what Obama did. Not only did he order the open-air memorials closed, he ordered that anyone who violated the barricades were to be arrested. That was too much for Levin. The more he read, the louder grew his voice. The link below is to a website that provides the audio of that portion of Levin’s show. It is great! Conservative talker Mark Levin has a stern warning for President Barack Obama and his administration: Don’t mess with the World War II veterans. Levin, author of “The Liberty Amendments: Restoring the American Republic,” told his audience on his Wednesday radio show should there be any action taken against those veterans for visiting the World War II Memorial on the National Mall, even with the government shutdown, he would bring 500,000 people to march on the Washington, D.C. in response. Levin iterated that the sentiment was heartfelt and was in no way a stunt. The government has been shut down for a day now and what’s happened. Obama ordered barricades erected around the WW II and other memorials around DC to prevent WW II vets from making a pilgrimage to their memorials. Yesterday, those vets moved the barricades aside and toured their memorial regardless of the threats of arrest from government peons. Today, they plan on visiting the Lincoln memorial. Already, government employees are hard at work erecting barricades around it as well. There is no reason for these memorials to be barricaded. They are in the open. If the concern is about trash and trash pickup, I’d bet there are plenty of civic organizations willing to step in and keep the memorials clean. No, the only reason for this is spite. Spite by Obama against those who won’t support his socialist agenda and spite against anyone who may, at some time, oppose him. If the administration and democrats really want to enrage the nation, all they have to do is to arrest these 90-year old veterans. Many are in wheelchairs and in fragile health. If one of them dies as a result of the mishandling by government goons, I have no doubt, many more, veterans and non-veterans, will be marching to Washington. I saw a passing notice that the Oathkeepers are mobilizing to help these veterans overcome their obstacles. There are some others who are protesting the shutdown. Who are they? 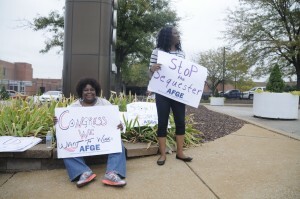 Union government workers, sitting on their butts on the curb holding signs. For many, this is the same activity they do while on the government payroll. We only have to look at the ‘non-essential’ percentages to see the waste in government. Ninety-five percent of the IRS, Department of Education, the EPA, Department of the Interior, and many more departments and agencies have massive ‘unessential’ number of employees. I expect, if the shutdown continues, some of these will be declared essential…to satisfy the unions if for nothing else. In the meantime, Harry Reid and House democrats continue blocking every proposal. Fund the military—blocked, remove the Obamacare subsidies for Congress—blocked, fund individual agencies like the Border Patrol—blocked. The democrats can’t blame the ‘Pubs for this shutdown. It has been carefully orchestrated by Reid and Obama. So, as I write this, what is the headline on Drudge? When Armstrong asked for her name, he says she did not give it to him and then promptly hung up the phone.